Your MLA membership gives back! 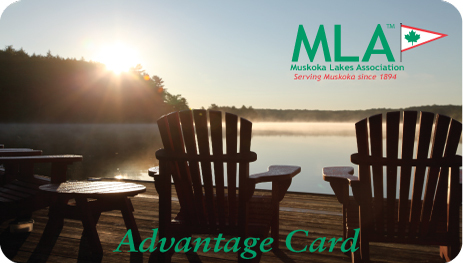 After introducing the MLA Advantage Card in 2010, we and a variety of Muskoka businesses offer you the opportunity to save while you support the local Muskoka economy – a benefit available only to Muskoka Lakes Association members. Use your MLA Advantage Card throughout the year to enjoy savings with local businesses. Please see the list below for our current offers. Please note that most offers include specific conditions and dates. Check back often for more offers. To download a PDF file of all our current participating retailers click here. Receive a "Save $25 when you spend $100 or more" coupon when you sign up for our AO Rewards (receive 5% rewards when you pay with Cash or Debit). 10% off any purchase over $40. Free dessert with the purchase of a meal. 20% off the regular of one item. 10% off chemicals and service from May to November. (705) 645-9444 www.muskkaartsandcrafts.com 15% off framing services, 10% off art supplies. Momma Bear’s Ice Cream & Sweets New! Receive a complimentary premium hand crafted waffle cone with your Kawartha Dairy ice cream purchase. 10% off any motorized screen, shutter or boathouse door. Once a proposal for work is established, we offer a 10% discount on the total professional fees excluding tax. Gem & Dia Jewellers Inc.
(705) 765-5700 www.brownsappliances.com $50 of free laundry soap with Whirlpool or Maytag front load laundry sets. With the purchase of a Napolean BBQ get a free cover, assembly and mainland delivery. 2 for 1 medium coffee from open till 10am (Monday—Wednesday, one order per customer) 10% off online bakery orders placed minimum 24 hrs in advance. 20% off all in stock fresh cut flowers on Saturday, 30% off on Sunday. Free Cowtown BBQ Rub with the purchase of any fresh or frozen meat product (Steak, chicken, burgers, ribs) $20 minimum purchase. 10% off all in stock merchandise. 10% off in Home Consultation. 10% off hourly rate installation. Are you a Muskoka retailer that would like to join the program? We'd be happy to have you sign-in to create a long-lasting partnership. Please give us a call for more information at (705) 765 5723 or email us at info@mla.on.ca.